A small urban winery located in Jack London Square in Oakland, California owned by winemaker Jeff Cohn. 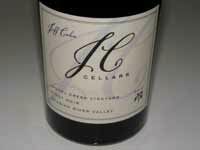 After graduating from Fresno State University, he worked for Rosenblum Cellars, and his Jeff Cohn Cellars became one of the first urban wineries to offshoot from Rosemblum Cellars, the original Bay Area urban winery. Cohn left Rosenblum in 2006 to concentrate on his own wines. Most of production is Rhone varietals and Zinfandel.